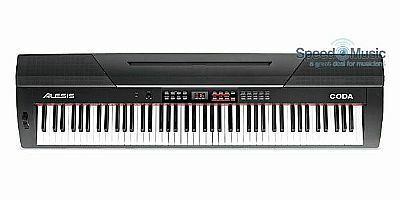 The Alesis Coda is a new, full-featured 88-key digital piano that has the versatility and rich sound today’s musicians are looking for. It's the perfect solution for any situation where a full-size keyboard is needed, but where portability and affordability are also important. 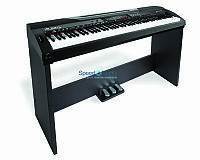 This is the ideal piano for students, stage and studio use, schools, theaters, and houses of worship. The Coda has 20 built-in piano voices (such as Grand Piano, Electric Piano, Drawbar Organ, etc.) and the versatility to split or layer two voices simultaneously. With 50 piano accompaniment styles to choose from (such as Slow Rock, Vienna Waltz, Jazz Pub, etc. ), players can select the perfect style for any solo performance situation. Players can even connect the Alesis Coda to their computer via the USB-MIDI port for full 88-key control of their virtual instrument software or plugins. Alesis designed the Coda Series to have it all: great sound, a full-size 88-key keyboard and complete control over virtual instrument software and plugins. 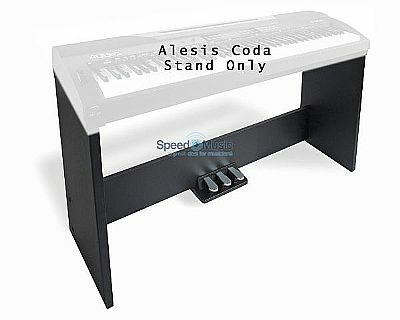 Optional stand: In addition, the Alesis Coda Keyboard Stand is available as an accessory. The Stand connects to the Coda with just a single cable and adds three-pedal functionality: Soft, Sostenuto and Sustain. Its genuine wood finish adds a classic touch to any setting. £79 extra.